Over the decades, The Saturday Evening Post has featured dozens of classic images of Santa Claus on their December covers. Here are a few of our favorites. Sargent had nearly 40 Post covers under his belt before he painted this heartwarming Christmas cover of a little boy (Sargent’s neighbor Richie McCullough) who is eager to take advantage of an opportunity to do a good deed — especially with Christmas only a few days away. Not everyone in this household welcomes Santa’s Christmas Eve visit. Can this befuddled Santa coax Fido into returning his coattail? Insiders understood this scene as a veiled reference to Leyendecker’s disciple Rockwell, whom art critics frequently described as riding his mentor’s coattails. 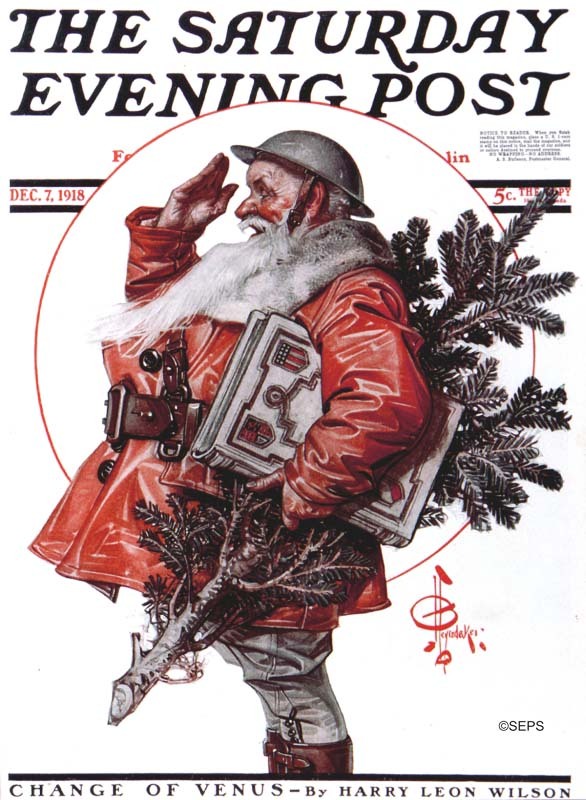 This Santa-as-soldier was painted by J.C. Leyendecker for the December 2018 cover. By the time this issue was published, the armistice had signed, bringing the Great War to an end. Santa and the rest of the troops could look forward to Christmas at home. No matter how heavy the pack or how pressed for time, good St. Nick will always pause for a hug. And what a heavy load it is! You can almost feel the enormous strain weighing down on Santa’s collapsing boots. Artist J.C. Leyendecker painted more covers for The Saturday Evening Post than any other artist. While he may have been better known for his cherubic New Year’s babies and his strapping sportsmen, he was no slouch when it came to illustrating classic portrayals of Santa Claus. In January of 1922, Saturday Evening Post editor George Horace Lorimer, feeling the weight of the season, commissioned Norman Rockwell to paint a worn-out Santa for the coming December cover. The elves were Rockwell’s first attempt at cartoonish figures for a Post cover. If you look closely, you’ll see they are miniatures of his Santa model, John Malone. It was no trick to capture Malone in this pose, as he frequently dozed off in Rockwell’s studio.